I am playing catch up in my little one’s baby album. Since she’s sleeping in the photos I wanted to use, I decided to stamp out “Goodnight Moon,” a children’s book. I used various ink colors to match the HKC exclusive scalloped paper from the May Kit, and stamped the alphas on some wonky lines that I stitched onto white cardstock (totally inspired by Paige Evans). I cut out a giant heart out of another piece of white cardstock with my silhouette machine and then hand stitched around it. I adhered the heart on top of the stamped piece, then adhered it to the scalloped pattern paper. I added 2 photos of baby Ruby from the hospital, and a simple title using the Pink Paislee mini alpha thickers. I embellished the photos with some Amy Tangerine ephemera, enamel dots, Simple Stories chipboard flowers, and Pretty Little Studio word stickers. The pink ruffle heart embellishment is from Crate Paper. 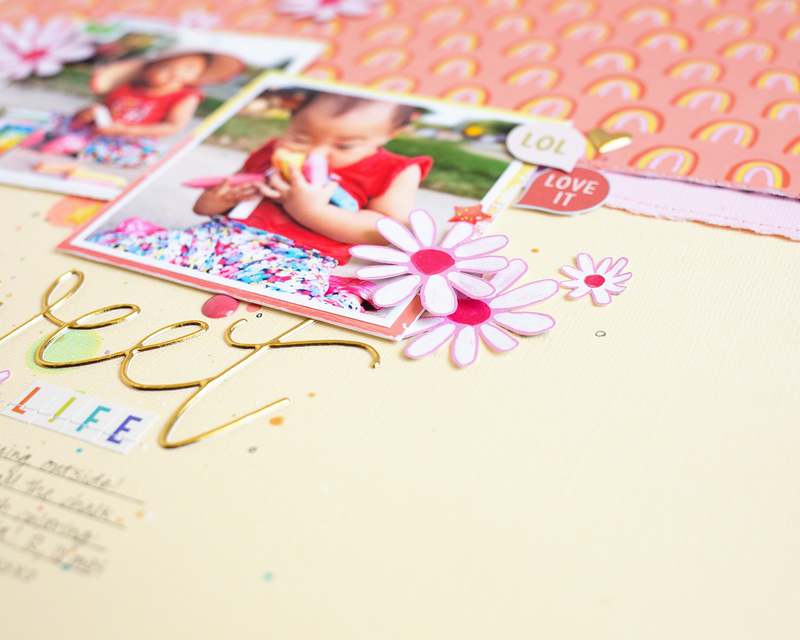 To finish my layout, I added a little bit of Heidi Swapp gold color shine and my journaling. I love how my layout turned out. I hope I’ve inspired you to get out some alpha stamps. I used the May 2018 Main kit, Project Life kit, and Embellishment kit. I stayed pretty true to the design. I used 3 photos instead of 4, and moved the title. I did a little bit of mixed media work on the background. I used the dotted Heidi Swapp lace paper as a stencil with the Vicki Boutin paints. The colors are perfect for that Hip Kit Club exclusive pattern paper. I love that paper! You better believe I gutted that baby! I love the look of mixed font titles! I’m pretty picky about what fonts go together, but I think these look great together! I used the Crate Paper glitter word thickers and the Pink Paislee mini alpha thickers to create my title. I love that the PP mini thickers come with both a gold and rose gold side! I also love that the foam on the rose gold letters is a deep blue! I kept the embellishments really simple since the photos take up most of the page. 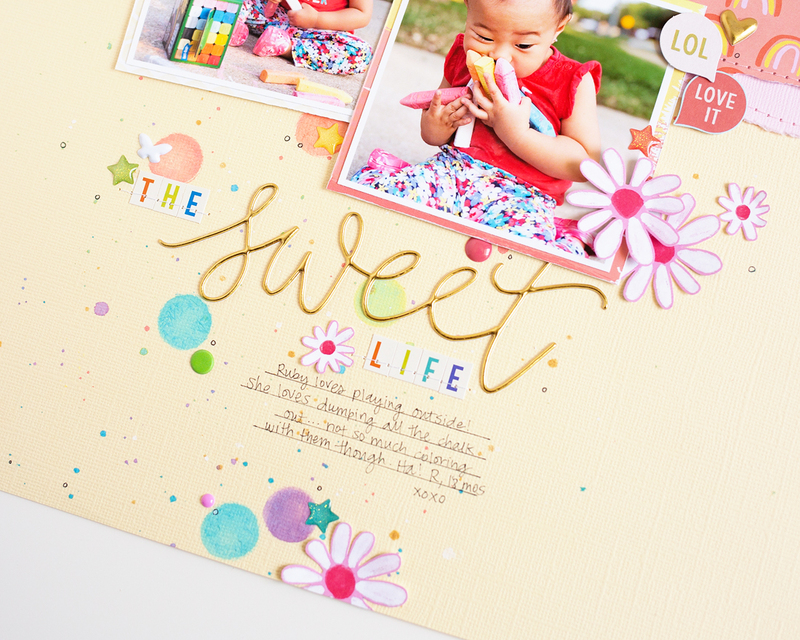 I added just a few embellishments: the Pretty Little Studio mini word stickers, enamel dots, Simple Stories chipboard hearts, and Amy Tangerine clear butterfly stickers. That’s it for me! I hope I inspired you to play along in our sketch challenge…you still have plenty of time to join in! Make sure you head over to the Hip Kit Club Group page on Facebook for details on how you participate in the challenge, get inspiration, and win a gift certificate to the Hip Kit Club store! Hello friends! Today I’m sharing a layout inspired by the Hip Kit Club May 2018 mood board, and I am also incorporating colored cardstock. I was inspired by the Mood Board in several ways. The first thing that jumped out at me was the wreath- the circle, the flowers, and the natural elements of the wreath. I was also inspired by all the florals and colors of the mood board. I am using some of my favorite photos of Ruby when she was a super chunky 4 month old in her jumper. These photos are already more than a year old. Where does the time go?! I started out by machine stitching a big circle over and over on my cardstock to echo the wreath. Then I added some stamping using the Vicki Boutin stamps from this month’s color kit and Distress Oxide ink. I watered down some of the VB paint from the color kit and splattered it across the cardstock. Next, I backed my photos with some pattern paper and adhered them to the layout with foam tape for a little dimension. I embellished the photos with the floral Simple Stories chipboard stickers, Amy tangerine clear butterfly stickers, and Bella Blvd puffy hearts. Since most of the elements were on the top right portion of my page, I wanted to bring something to the lower left side. I added a small embellishment cluster, and I backed my cardstock with pattern paper, but only on the left and bottom sides. To add a bit of the natural element of the wreath, I tied some natural twine on the Amy Tangerine tag. I chose to use the Bazzill blossom cardstock from the May 2018 cardstock kit. I also used the May 2018 Main kit, Project Life kit, Embellishment kit, and Color kit. I love how my layout turned out. I hope you do too! How is the weather lately in your neck of the woods? Here in Texas, we have had some beautiful spring weather, but it has already started to get really hot. Before it starts to get into the high 90s and 100s, we have tried to get as much outside time as we can. We are introducing Ruby to long sunsets, bubbles, wagon rides, and sidewalk chalk. I made a layout featuring her hoarding the sidewalk chalk. It was just so cute. She was trying to hold them all, but when she’d pick up one more, another one would fall out of her hands, and on and on. Ha! I absolutely love the photos I was able to take! Don’t you think these photos would be perfect for a Crayola ad? LOL! I was challenged to use layers and fussy cutting on this layout… I love both of these techniques, so I was happy to! I will be using the April 2018 Main kit, Cardstock kit, Embellishment kit, Project Life kit, and Color kit. I layered pattern paper and 2 cardstock colors for my background, I used some of the exclusive Project Life cards for layers behind my photo, and I layered my embellishments by using flat adhesive and foam squares. I thought that rainbow Dear Lizzy paper was perfect for this chalk layout. To continue the rainbow theme, I used different colors of Distress Oxide inks (several from past color kits). I have been putting a lot of these small circles on my layouts recently. I have been using an sponge ink dauber tool, and I love how it looks! A couple of the sheets of Shimelle mini alpha stickers are rainbow, which were perfect! I added some little embellishments in a variety of colors to continue the rainbow theme. I really love those glittery enamel shapes! I really love how my layout turned out. 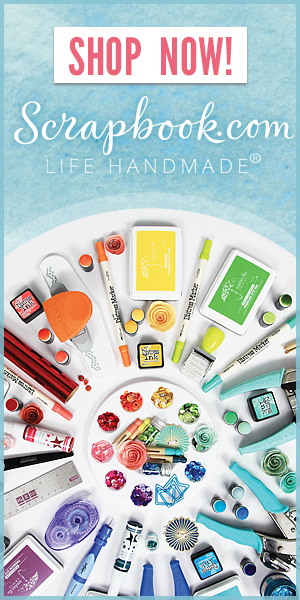 I hope I’ve inspired you to get crafty! Hey friends! Today I’m sharing a layout I made for my daughter’s 12th birthday. She’s growing up so fast…where does the time go?! I am using the Hip Kit Club April 2018 Main Kit, Embellishment Kit, Project Life Kit, Color Kit, and Cardstock Kit. I really wanted to use the 2×2 paper pad by Paige Evans found in the Embellishment Kit, so I got out my Nesting Heart metal dies, and started die cutting away. I also made a few mixed media pages that I die cut hearts out of. On a sheet of white cardstock, I used the stencil and white embossing paste. On another sheet of white cardstock, I used distress oxides to watercolor and ink splatter. I layered different hearts, and stitched down the middle. I have done this technique before, as seen in the layout on this post, but I decided to keep the threads long, a la Paige Evans, and fellow team members Missy and Jana. I loved the blue cardstock and pink stitching on my last layout, so I repeated it on this layout. I also tucked in some hidden journaling under the big photo, since I didn’t really see a good place for it on the layout. I love making these yearly layouts to remember what my girls were like at these ages. I love how this one turned out! I hope you like my layout, and I hope I’ve inspired you to get crafty!